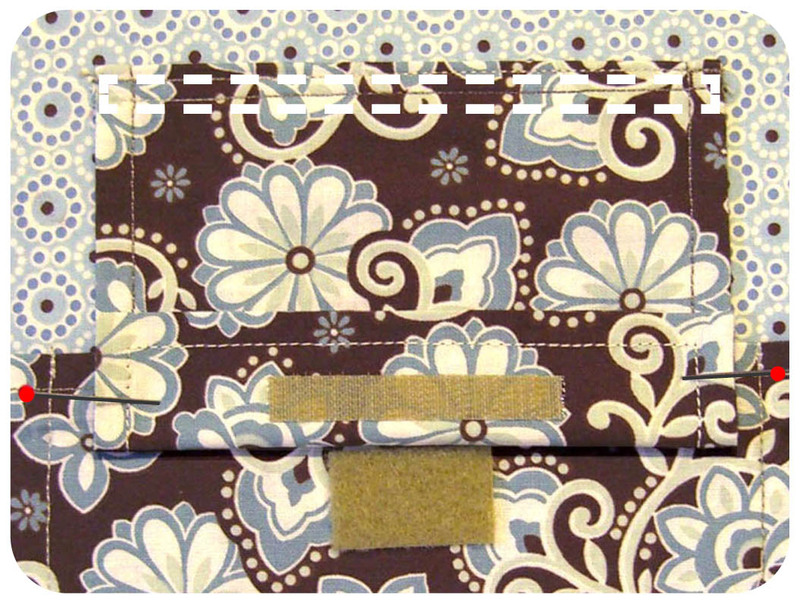 Lazies, How would you like a little more privacy and security for the pockets in your favorite tote, purse or bag? 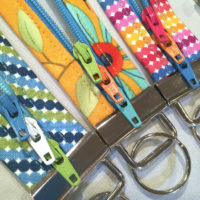 Adding a flap closure using the new Fusion fusible Velcro is a wonderful way to make the most of this versatile notion. Download the free printable tutorial below. 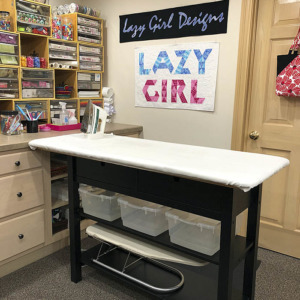 Since the ‘Fusion’ version of Velcro is a fusible, pieces of Velcro can be added at any time during – or after – a project! The possibilities are absolutely Lazy! Add safety and privacy to an open-top pocket. 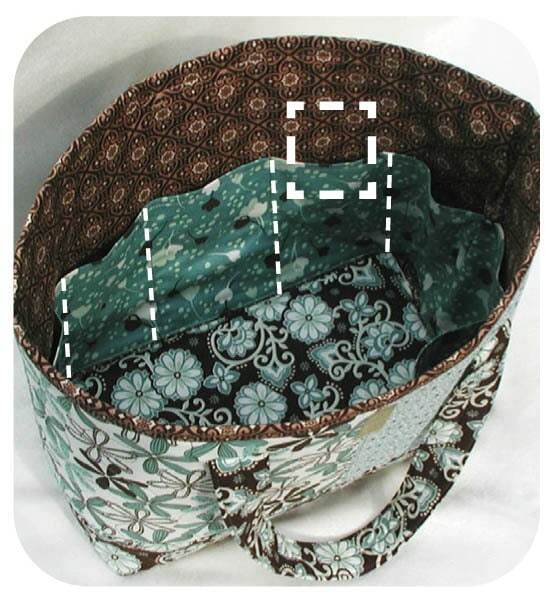 The Miranda Day Bag from Lazy Girl Designs (pattern #LGD123), is loaded with 10 ‘pockets in the round’ as shown here. I’ve highlighted the pockets in the picture above with the white dashed lines. The white dotted square indicates where a flap closure will be added to the lining for one of these pockets. 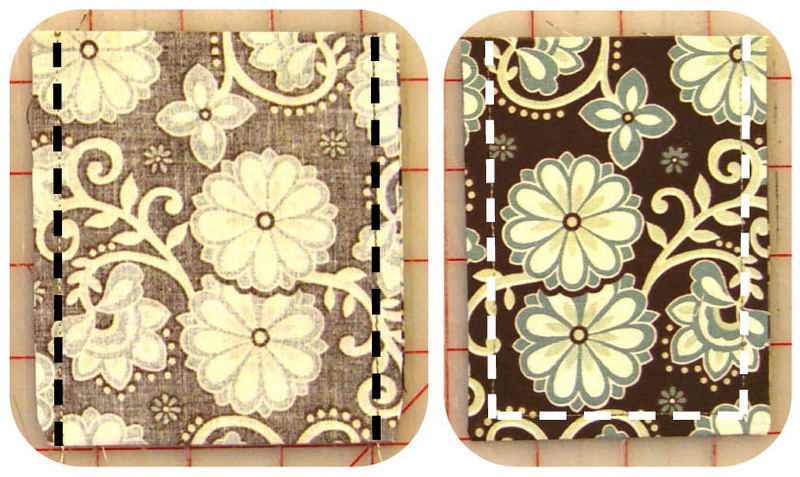 Make a simple flap from coordinating fabric. 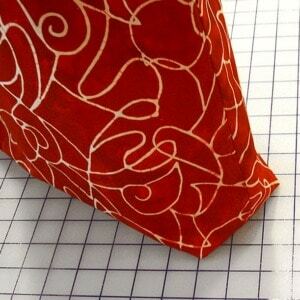 – Cut a piece of fabric the width of the pocket by 9” high. My pocket is 4” wide. – Fold flap fabric in half, right sides together, matching short edges (should measure 4” x 4 1/2”). 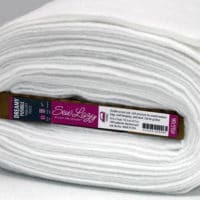 – Use 1/4” seam allowance, stitch side edges. – Topstitch along the three finished edges, press. A little attention to the back of the flap. 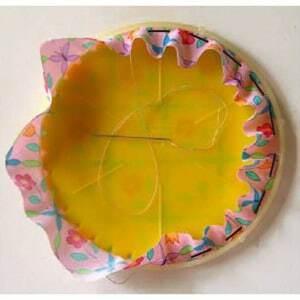 – Fold 1/4” at raw edge to the back side of the flap and press. – Cut rough half of Velcro 1 1/2” to 2” long. Then cut it down the center lengthwise, approx 3/8”. – Attach Velcro to back of flap at least 1/2” from edges. Note: Follow manufacturer’s directions for fusing. 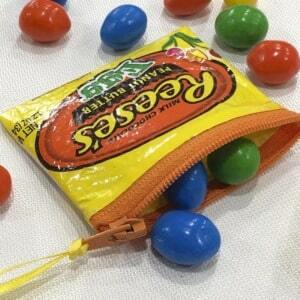 Overlap the pocket and flap so Velcro can meet. 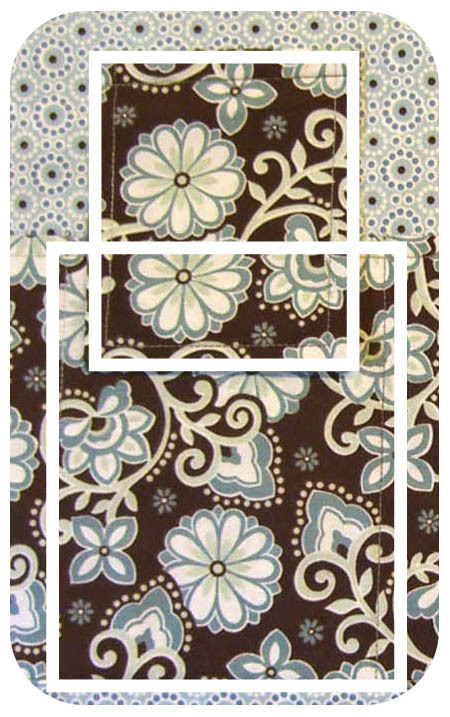 – Flap and pocket should overlap 1 1/2” as shown with the two white boxes in the picture above. 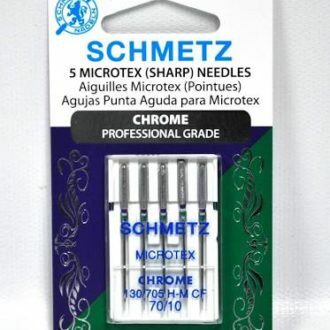 – Stitch top edge of flap to lining as shown in the picture below. 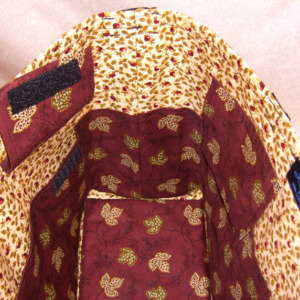 – See ‘Note’ at the end to learn how to fuse rather than sew flap to bag. – Stitch a box pattern (shown in white toward top of picture) big enough to conceal the raw edge on back of flap. – With flap in place, fold bottom edge back to reveal rough piece of Velcro and pin. 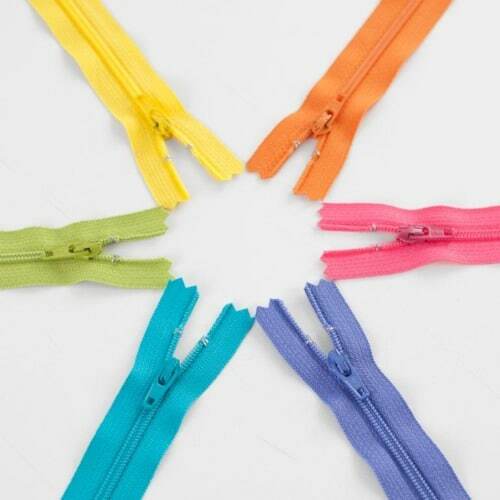 – Cut 1″ piece of soft half of Velcro and attach to pocket, centered below the Velcro on the flap. 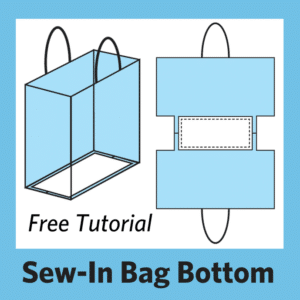 – Note: I’ve sewn the flap closure in place in this tutorial. To add a flap to a finished bag, attach Velcro ‘Fusion’ to the top edge of the back of the flap, cover the raw fabric edge. Then fuse Velcro to the lining to match. « Previous PostGive Your Bag A New Look In A Cinch! Oh Joan I love that idea. 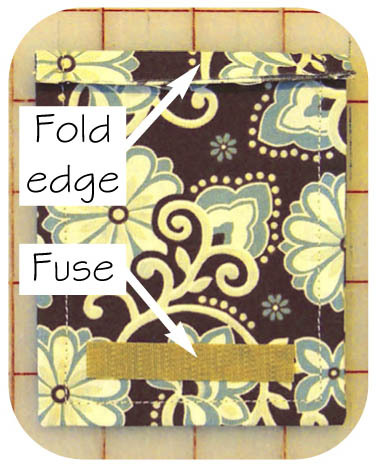 I use that fusible all the time now and have made several Wonder Wallets with it. Sometimes I have cheated on my doll outfits with it (hey ya’ gotta do what ya’ gotta do!). It’s a must have! Thanks for the tutorial I will definitely put one in my Lovely Miranda! I would like to ask if it is possible to have a printer friendly way to print the instructions you have available? Thank you. http://www.adobe.com for a free download of that software. I love this purse! 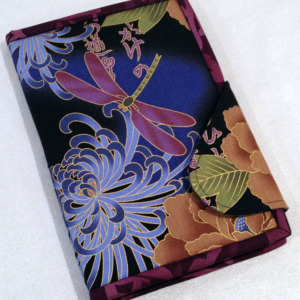 and I really love the fabric…. can you tell me what brand it is? I’ve been looking for chocolate/mint forever! !